Bad food has a history. Swindled tells it. Through a fascinating mixture of cultural and scientific history, food politics, and culinary detective work, Bee Wilson uncovers the many ways swindlers have cheapened, falsified, and even poisoned our food throughout history. In the hands of people and corporations who have prized profits above the health of consumers, food and drink have been tampered with in often horrifying ways--padded, diluted, contaminated, substituted, mislabeled, misnamed, or otherwise faked. 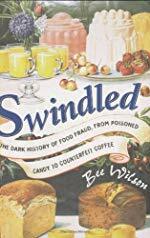 Swindled gives a panoramic view of this history, from the leaded wine of the ancient Romans to today's food frauds--such as fake organics and the scandal of Chinese babies being fed bogus milk powder. Wilson pays special attention to nineteenth- and twentieth-century America and England and their roles in developing both industrial-scale food adulteration and the scientific ability to combat it. As Swindled reveals, modern science has both helped and hindered food fraudsters--increasing the sophistication of scams but also the means to detect them. The big breakthrough came in Victorian England when a scientist first put food under the microscope and found that much of what was sold as "genuine coffee" was anything but--and that you couldn't buy pure mustard in all of London. Arguing that industrialization, laissez-faire politics, and globalization have all hurt the quality of food, but also that food swindlers have always been helped by consumer ignorance, Swindled ultimately calls for both governments and individuals to be more vigilant. Bee Wilson has written quite a few books on food history and food science, and this ones a good one. People sometimes have a habit of looking at the past of food with rose-tinted glasses, oh if only we ate like our grandmothers etc etc. Well our grandmothers were eating poison pickles and chalky bread- and if you go even farther back- would you like to drink the lead sweetened wine the Romans did? As long as there was a profit to swindling, people will sometimes swindle, with or without modern science.